Danny Harris is a DC-based photographer, DJ, and collector of stories. He launched People’s District, a blog that tells a people’s history of DC by sharing the stories and images of its residents. You can follow People’s District on Twitter @PeoplesDistrict, and can read his previous columns here. “D.C. was great when I was growing up, but this ain’t no place to raise children any more. Now that I got two kids, there isn’t too much that I like about D.C. I really want to get out of here. Don’t much mind where I go, as long as it is not here. I am being for real. 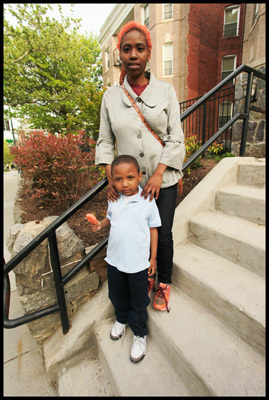 “I was raised uptown in D.C. and then moved to Maryland. I liked it there for my kids because it was safe and quiet, but I be going crazy with nothing to do. I recently got an apartment in Southeast. I really didn’t want to move there, but an apartment came through the city where I would be able to live on my own with my two kids. “I tell you, Southeast ain’t nothing but corruption. I don’t want to live or raise my children here. It’s like every time my son gets up out of the house, he gets into it with somebody. And my son is only four years old. My daughter is one and too young to deal with all of this. What is wrong with these parents where my son can’t just go outside and play? These parents ain’t raising their kids right. “See, I teach my children discipline. My son knows what’s right and what’s wrong. You can see a difference in how I raise my child and how they do. But we all got to suffer from these parents who don’t care. That just ain’t right. So, I got to shield my child and keep him in the house or bring him to Northwest when he wants to go to the playground. But now that it is getting warm outside, it is going to get too hot to be in the house all of the time. When he does go out, I keep him close where I can watch him.